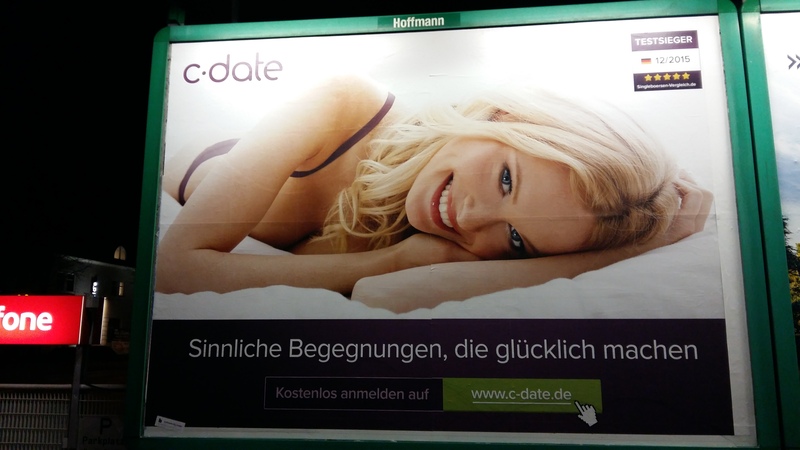 Street advertisers are currently obsessed with selling online dating sites. The most in-your-face is c.date (left). It is clear enough without the strapline “sensual encounters make you happy”. What’s more, it is award winning (Testsieger, top right of poster). The awarding body is, of course, that fearsome tester, ‘singles comparisons market’. 5 Stars, no less. c.date has gone for the blanket approach. This example was found on a main route into the centre of Munich with smaller versions positioned every 50 metres, or so, next to the entrance to supermarkets, fuel stations and pharmacies! Another dating site has taken a different visual approach, but equally blanketing in terms of positioning the posters (right). 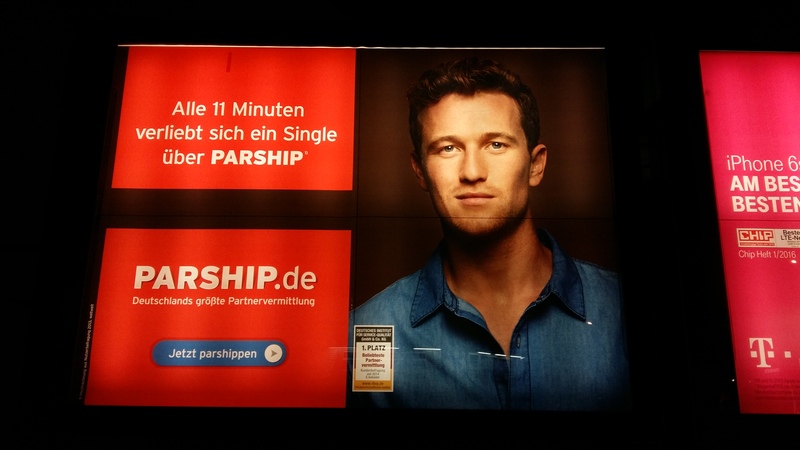 Parsh ip.de posts pictures of handsome people informing commuters that every 11 minutes a single falls in love through Parship! That is quite a claim if true. It does not seem to be award winning. But maybe the stat speaks for itself? If you are a man without perfect bone structures, straight teeth and a bit of facial hair, the stat goes down to every 11 years. Probably.